I thought I'd use our fun Love à la Carte Set since it has an image of a Coffee Cup with some sugar - but I really wanted to use a kitty too so I pulled out the simple cat image from Newton's Antics! I stamped and colored the kitty image directly onto the cardstock but I used a scrap piece to color the coffee image and then I fussy cut it out. I thought that I would want to put the cup in front of the cat but I ended up putting the cut next to him instead and adding some washi tape. It kind of looks like a diner table, don't you think? 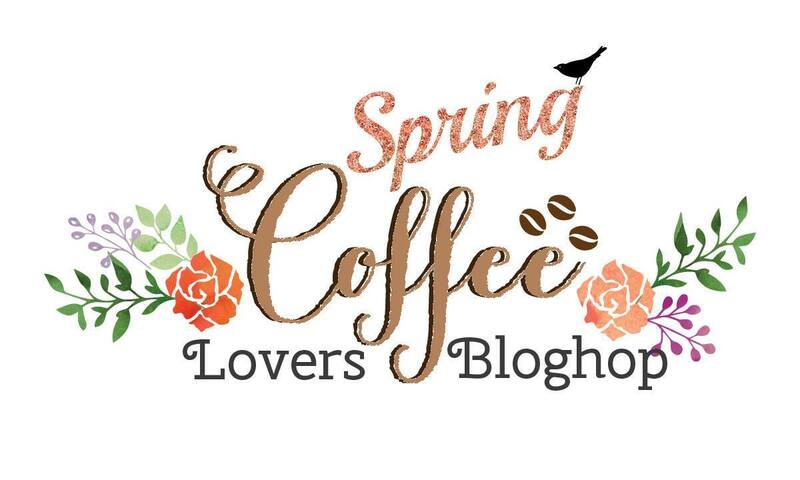 Then I grabbed the "loves mew" sentiment from the Newton's Antics stamp set and added it curved above the coffee. So Cute I Love the stamp set you used!!! awwwwwww...this is so cute Jen! I love it...the colors are fabulous! Oh I just love your Newton stamp sets and this card is absolutely adorable!! So darling! Thanks for being a sponsor! So very cute- love the little sugar lumps! Very cute, I really love this! soooooooo adorable!!! thank you for being a sponsor! So cute, love how you used the two sets together, thanks for being a sponsor. This is so adorable! Newton loves coffee too! This is so cute. Loved reading how your cat really likes coffee. You said silly kitty NOT, he knows a good thing when he tastes it. Aww this is adorable. Thanks for sharing. You made me laugh with your coffee lickin' Newton story. I love love the soft background colors. Newton is adorable as per usual and the little sugar cubes on the spoon,soo cute!! what great colors on kitty and your coffee cup and saucer! thanks so much for being a sponsor! Love it! Newton should meet my Jasper-cat...they could have coffee together...cats! I LOVE your bright and colorful kitty! Adorable! That is such a cute story about your cat. Ours will sniff the coffee and then give you irritated cat look. Your card is adorable too. This popped up in my newsfeed earlier....so adorable! Thanks so much for sponsoring! 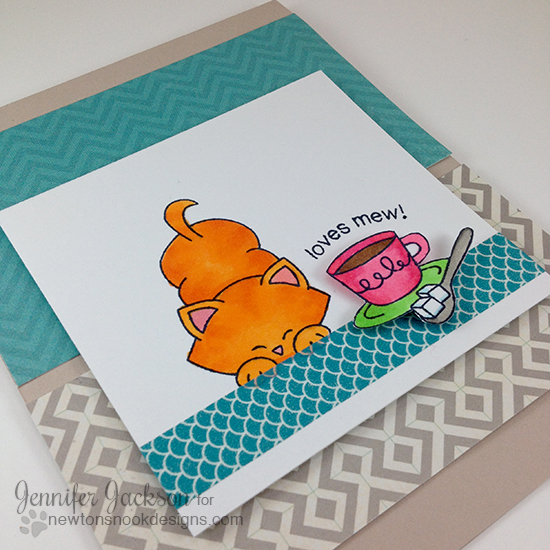 Love cats,Jen, love your card, wonder if kitties would drink a warm latte if offered? Have a wonderful Friday and thanks for being a sponsor! Such a cute card! Love the strip of washi tape and it really does look like a table. And Newton is so silly, I've never heard of a cat liking coffee LOL! A caffeine craving feline?! Now that's a new one! :) This card is adorable and made me grin. THANK YOU for being a sponsor and helping to make this hop so much fun for the rest of us! Super cute card! Isn't that funny that a cat would like coffee?!! Happy Stamping! Love it, Jen!!! I linked up to the hop as well!! Thank you so much for sponsoring! What a great card Jennifer! Love the little newton kittie! So adorable! I love the little sugar cube detail! Thanks for being a sponsor! Oh, I can't imagine a kitty on caffeine! Darling card! Thanks for being a sponsor!! OMGosh this is so super cute! Thanks for the chance to win!!! Ack!! This is so adorable!! Love that sweet kitty and the great papers you used. I have a little kitten that will drink out of my water glass any time it is where she can get to it. I wouldn't think cats would like coffee, though. Who knew?! Adorable card! Thank you for sponsoring the hop! How cute--I like your coloring. Adorable card! I love Newton! Too cute! Love those patterned papers too! Cute - C U T E - CUTE !!! Adorable! Beautiful co-ordination of patterns and colours! I know cute little Newton wants to share that cocoa!!! This is so cute!! Awesome coloring. Like the sweet card, stamps & sentiment. What a sweet card! Also love that your kitty loves coffee! Thank you for being a great sponsor and sharing great inspiration! love how you pulled the two stamp sets together! CUTE! What an adorable card! Anything with Newton gets my vote! Very cute card. I love how you popped the cup and spoon. Oh my goodness that kitty!! !So stinkin cute! This card is so cute and sweet.It really is creative. Oh, so much fun, and so funny about Newton really liking coffee! Thanks for sponsoring the hop. What a super CUTE card!!!!! Just a cute Newton card! Does he really stick his paw in your coffee, hahaha! Oh so sweet! Love both stamp sets! Great card - so cute! Thanks for being a sponsor!! Such a darling creation and beautiful combination of both the stamps!!! Thanks for being a sponsor! Such a great card, love, love it nice colors and great design. Thank you for being a sponsor. Totally adorable card and fab design! Thanks so much for being a sponsor! Awwww, I just LOVE this stamp set, such a cute project! I'm completely in love with this adorable kitty! How fun that Newton loves coffee. Hilarious! Thanks for being a sponsor! So cute, love the clean design of your card. Thanks for being a sponsor. love these sweet images and so colorful and happy Jennifer. LOL -- my cat wasn't into coffee, but would drink the cold dregs of my tea! This card is so cute, I always love seeing Newton on a card! Thanks too for sponsoring the hop. Newton is the sweetest!!! That's hilarious that he actually likes coffee!!! Thanks so much for sponsoring!! cute card and crazy coffee loving cat! Such a sweet card and I love your stamps! This is the cutest cat card! Una tarjeta muy alegre me gustan los colores usados !! !